The Hampton Inn Eugene hotel is located on Highway 126W /11th Avenue/ just minutes from the airport and adjacent to the West End Business District. Eugene Oregon attractions include boating fishing water sports performing arts snow skiing hiking golf and the Autzen Stadium home of the Oregon Ducks. Nearby restaurants include The Koho Bistro Steelhead Brewery Hole in the Wall Barbeque or the historic Oregon Electric Station Our spacious rooms include complimentary high-speed internet three 2-line phones with complimentary unlimited local calls 25 inch color remote control televisions with satellite cable and HBO ESPN CNN and FOX. Pay-per-view movies are available. Every room also includes a coffeemaker hair dryer iron and full size ironing board. Microwave and refrigerators are available in all suites and studies. 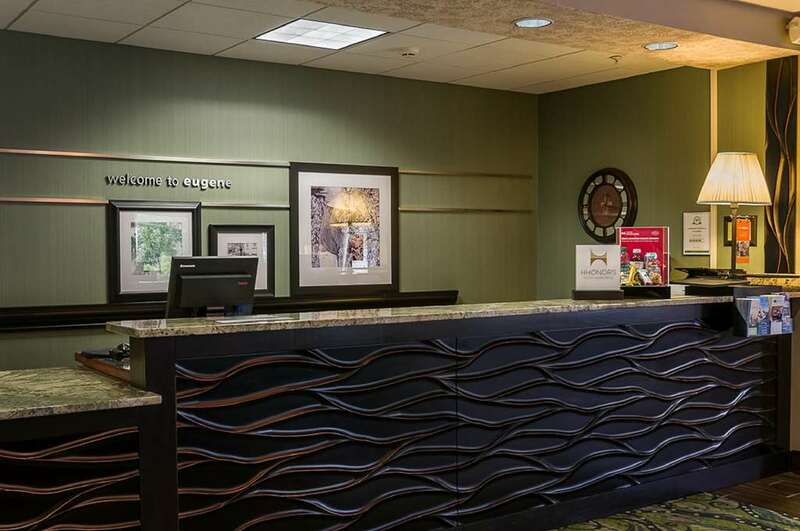 The Hampton Inn Eugene hotel features complimentary parking a heated indoor pool a 24-hour fitness center and a nearby jogging/bike path for your enjoyment. A deluxe complimentary breakfast buffet is served every morning from 6am to 10am. Gourmet coffee and tea are available in the lobby 24 hours a day. This Hampton Inn provides dry cleaning valet service Monday through Friday as well as an on-site self-serve laundromat. We are pleased to offer fax and photocopy services computer printers and high-speed internet access at the front desk. We love having you here in Oregon at the Hampton Inn Eugene hotel. Fast Food Options: Taco Bell McDonalds Carl*s Jr. Wendy*s Subway Burger King Multiple pizza places and many more for your choosing. Izzy*s Buffet: Pizza Salad Bar Hot and Cold Buffet. Oregon Electric Station: American menu. A historical landmark where you can dine in antique train cars designed in the flamboyant Georgian revival style. Wetlands Brew Pub - Sports Bar: American menu. Hole in the Wall Barbeque: Barbeque american menu. Koho Bistro: Pacific Northwest fresh seafood quizine.